Congratulations to 1st Hartlepool Company which has been given the Freedom of the Borough of Hartlepool in a presentation made on 18th May 2017. Currently the Company has 27 lads attending each week aged from 5 to 16 years. Hartlepool Mayor, Councillor Robert Cook presented the latest Queens Men, Jaxon Simmonds and Anthony Miller with the Queen’s Badges last year. 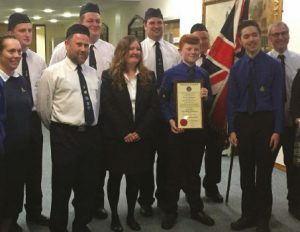 The Presentation of a framed parchment and engraved silver plate was accepted by Company Captain Paul Craggs on behalf of all members past and present.